(a member of Aberiginals, the Aberystwyth University orienteering club, whilst he was a student there in the 1970s) before his own untimely death. Nev specialised as an orthodontist, living in Bromsgrove. With a love of Wales, upon their retirements they moved to Norton, Presteigne. Nev and Mary had taken up orienteering whilst living in Bromsgrove, joining Harlequins OC. After moving across the border it wasn’t long before they attended a meeting at Welshpool where Powys OC (POW) was formed with a small membership of Garri Owen and Julie Fletcher, Nev and Mary, Dave Ormerod, Andrea and myself. Later such stars as David Pal, Anne and Richard Wilson, Mike Kay, Robert Griffiths and Malcolm Reynolds joined before the further expansion westward into Ceredigion. Initially, Nev took on the role as Club Treasurer for a time. He and Mary won the Welsh Championships on several occasions as well as representing Wales at the Veterans Home Internationals. One of my own recollections of Nev and orienteering was whilst competing at a Wrekin OC event near Shifnal (Lizard Hill). Nev, Andrea and I were on different courses but by some quirk of fate all reached the last control more or less at the same time. It was about 200m to the Finish, but as I glanced over my shoulder I saw Nev overtaking Andrea and Usain in a sprint to the finish!! Apart from his keen interest in orienteering, Nev was a keen Photographer, winning several competitions for his submissions. He also enjoyed Fly Fishing, again winning competitions for tying his own flies; Gardening; Cycling (Nev and Mary would often be seen pedalling around the Radnorshire lanes on their tandem). Nev and Mary also gave their time as volunteers to the Radnorshire Wildlife Trust. When not busy doing one of these activities Nev found time to attend night-school to learn Welsh. He also showed much skill in wood-turning, presenting the Club with a bowl that he had worked (to be awarded to the person who had contributed most to the Club in any one year). Andrea and I attended his memorial service in Presteigne, along with Anne, Richard and Robert and 80 others (despite the threatening inclement weather). My own impression of Nev is that he was very knowledgeable (a polymath springs to mind), highly intelligent and had a great sense of humour. Andrea and I were honoured to know him and pleased to be thought of as two of his friends. We will both miss him dearly. Robert Griffiths, MWOC Events Secretary …….. When Nev retired from Treasureship of POW, he handed me the Accounts all beautifully hand written. There was no sign of a computer spreadsheet anywhere! What hardwork keeping it up to date. Anne and Richard Wilson have provided some more photographs of Nev to share with us all. This one is of Nev awarding his bowl to recipeint Anne at the annual Club Dinner. 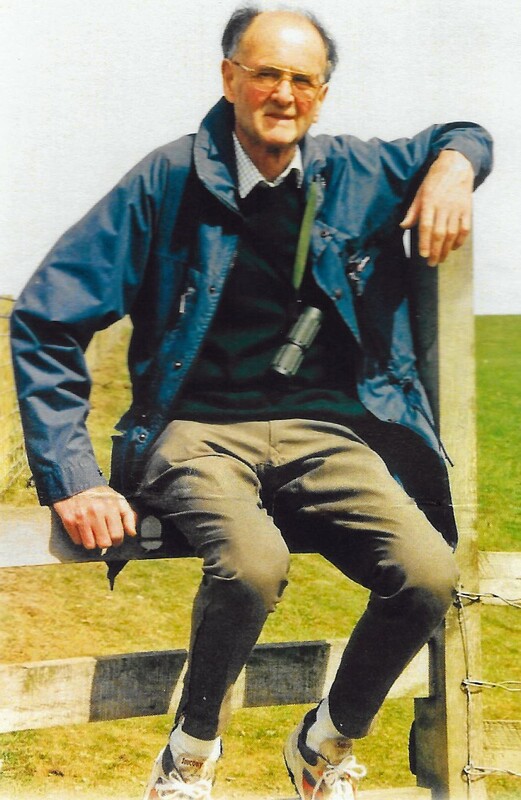 In 2003 Nev celebrated his 75th whilst staying with Anne and Richard, and that afternoon we (Anne and Richard), along with Dave and Chris Ormerod, ambushed him at his favourite fishing lakes, Teifi Pools (O connection there), with cake and champagne.